"I think I defined myself in a very good way," Graham said, suggesting Cantor failed to do the same with his constituents in Virginia’s 7th Congressional District. "I had (an) air game and a ground game very coordinated. Politics is war in another form. We had a lot of money, but we had 5,200 precinct captains, so we prepared the ground game - nobody saw that coming. We really overwhelmed them on the ground." South Carolina and Virginia were among five states to hold primary contests last Tuesday. Graham faced a divided opposition in his primary bid, but easily topped the 50% threshold needed to avoid a runoff. "The biggest fault attributed to me by my opponents was that I would work with the other side to get things done. I turned that into my biggest assets," he said. Graham's considered a strong favorite heading into the general election, where he'll face Democratic state Sen. Brad Hutto. War , War , War . And what is peace , have we forgot ? I hope he lost! Time to change congress!! This is one angry man always seems bitter if things don't go his way. He voted for Iraq and is an extreme war monger. Thanks God this man is not our president I think he would get us in World War III. Enough of policing the world it is time to take care of the USA and its children. We are one of the youngest countries yet we think we no everything and should make the world do it our way. 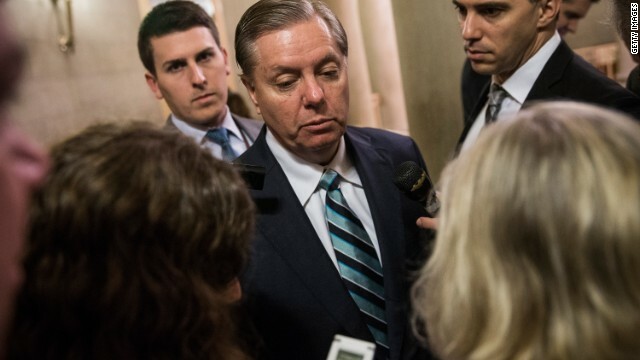 Time for Graham to retire he is part of our problem the same ol same ol beating a broken record lying to the people and doing what the party asked instead of the people. Time to fire anyone who is an incumbent no matter party. If he served one term he is a crook. Time to make these politicians afraid of the voters again, something they have for got due to massive amounts of money being spent to get them re-elected. Time for Graham and McCain to go hand in hand to the Social Security Office and put info retirement time for a new generation of Senators this coots are getting senial and there views keeping blowing in the wind depending on the directions. How many time do these coots have to keep changing there views to get elected and then do what they want. It's SC so he'd need not gloat too much. They're still voting for Strom Thurmond just out of habit. Too bad he was reelected. He has done some positive things, but his stances on immigration, and war, are both out of line with what America needs right now. I voted against him for his mistaken efforts to support immigration "reform" which is nothing but amnesty, and destruction of the political balance of power in America. We do not want to BECOME Mexico. War against other Americans?!?! That's all the people really need to know as to WHY nothing ever gets done in congress and to try their best to keep you from being re-elected. Such an attitude is shameful!! This is the mindset responsible for our nation being divided, with little or no chance of uniting anytime soon. The fact that people like this are elected to office, is positive proof that the voting public shuns their responsibility on election day, thus allowing parasites access to power and authority. I bet Ms Lindsay has never held anything that weighs more than mint tea glass with a little bit of sugar while sitting on her porch in SC. Really can't wait to see Lindsey Graham,Kevin McCarthy,Thom Tillis,Sheldon Adelson,Rupert Mourdoch,Karl Rove,Hayley Barbour,Grover Norquist and the GOP stuff Jeb Bush down the tea party's throats EXACTLY like they stuffed Romney down. Straight no chaser.